Backed by competent team of professionals, we manufacture, highly advanced Electric Stacker With Wide Leg. This Electric Stacker With Wide Leg runs on electricity. This Electric Stacker With Wide Leg is demanded widely across the global market for its flawless service and optimum performance. 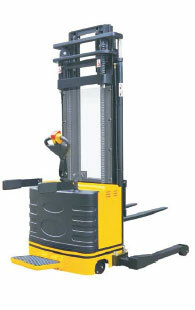 The clients can avail the Electric Stacker With Wide Leg from us at the market leading price. The rubber platform and safety guides increase operator safety and reduce fatigue, and they can be folded away when not in use. The mast is attached to the truck individually. The user can change the mast as per occasion. Hall-effect throttle control eliminates wear components and requires no mechanical adjustment.